As a leader one of the things I love to do it study other leaders and try to work out what made them good leaders, great leaders or bad leaders, and then see what I can apply from that in my own life. This Wednesday I'm going up to HTB with about 100 other leaders to spend a day with Bill Hybels, and I'll be doing a lot of studying there to learn everything I can from one of the greatest leaders I've ever met. I've still got the flip chart notes he wrote when he came and did an equivalent day in Bracknell last year - I get them out every now and again to touch them hoping that some of the anointing will rub off (only joking)! For me The Old Testament is always a particularly rich place to do leadership studies. For instance studying the contrasts between the lives of Saul and David, and getting to the bottom of what made David a great leader and Saul and such a lousy leader. So as I've been studying the early chapters of Nehemiah I've been looking hard at what made Nehemiah such a great leader. There are lots of things to learn there, his ability to cast a compelling vision and to recast it when the vision begins to fade, his organisational ability and his ability to ignore the critics. But the thing that has struck me time and again about Nehemiah is his ability to live with the tension of how much did he rely on God and how much does he take responsibility on himself to make things happen. I've termed that tension, for want of a better phrase, the dependency matrix and it looks a bit like the diagram in the flip chart picture above which hopefully you can read (I noticed no one was taking my flip chart pages home to keep as a memento!). To give it some reality I'll explain how it works in terms of someone who is unemployed and needs a job. Some people place no dependency on either themselves or on God. People in that situation are either lazy (don't need or can't be bothered to get a job) or in a state of despair (they've given up all hope of ever getting a job). Some people place all the dependency on themselves and have no expectancy of God intervening or being part of the process. I call these people practical atheists. They might call themselves followers of Christ but in reality they are living their lives like God doesn't exist. So in the job example this would be someone who's applying for jobs left, right and centre, has got their CV looking perfect and prepares diligently for every interview, but isn't praying about what is going on and has no real sense of even needing God to move for the situation to resolve itself. Other people are expecting God to do everything. So in the job example they are sat at home waiting for the phone to ring, or for that chance encounter with someone who is just going to offer them a job. They aren't applying for jobs or taking any practical steps to get one. These people are super spiritual. As Ben Davies often says "they're more spiritual than God". Then there are people like Nehemiah, who lived his life as though it all depended on God but at the same time as though it all depended on him. On Sunday morning I spoke from Neh 4:9 where they are facing attack, and Nehemiah's response is ".. we prayed to our God and posted a guard day and night to meet this threat". That's a pattern repeated again and again in the life of Nehemiah. Dependence on God but also a deep dependence on practical action too. I'd encourage you to read Nehemiah and look for them yourself, but to get you started take a look at Neh 1:11, Neh 2:4-5 and Neh 2:20. As Morton Morton C Blakewell (whoever he was) said so eloquently "Pray as if it all depended on God; work as if it all depended on you”. So where are you on the dependency matrix, and do you need to switch which quadrant of the matrix you are operating in. If this has provoked any thoughts in you then I'd love you to leave a comment to say what you think. 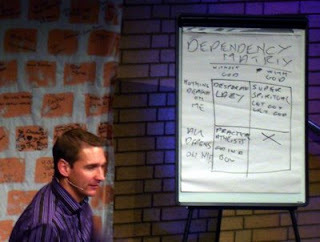 I produced a copy of your Dependency Matrix to accompany the sermon when I put it up onto the website. Great idea, thanks Geoff, you don't always know what's going on when just listening! simon - thanks for your thoughts. Dependency has been something of an issue for me this week. Nehemiah was an amazing man and chapter 4 is fantastic for showing practical application of faith and action - praying to God for help but also arming themselves to be prepared in case of an attack. rebecca m.
After hearing about what you said on Sunday (I wasn't there) I was reminded of a preach by John Kirkby about 'your best is good enough'. As we give our 100% God blesses that with his 100%. He's not there to just 'make up the difference' if we only give 80%. As long as it is our best that we give - our best is good enough. He said it much more clearly, but I'm sure you catch the idea!